The rarest colored diamonds in the world are red diamonds. The scarcity of these diamonds means that they’re quite expensive in an unmodified, untreated state. While some of the other diamonds like the blue or pink diamonds are considered rare as well, they have famous stones like the Hope Diamond or the Blue Moon, which are pretty large. Red diamonds have a famous counterpart in the Moussaieff Red, which is the largest red diamond in the world. That diamond is only 5.11 carats. Each year, only a few red diamonds are mined from around the world. This rarity meant that they weren’t really sought after until the late 1980s. In fact, there wasn’t much demand for red diamonds until April of 1987 when a red diamond weighing less than a carat was sold at auction for almost a million dollars. 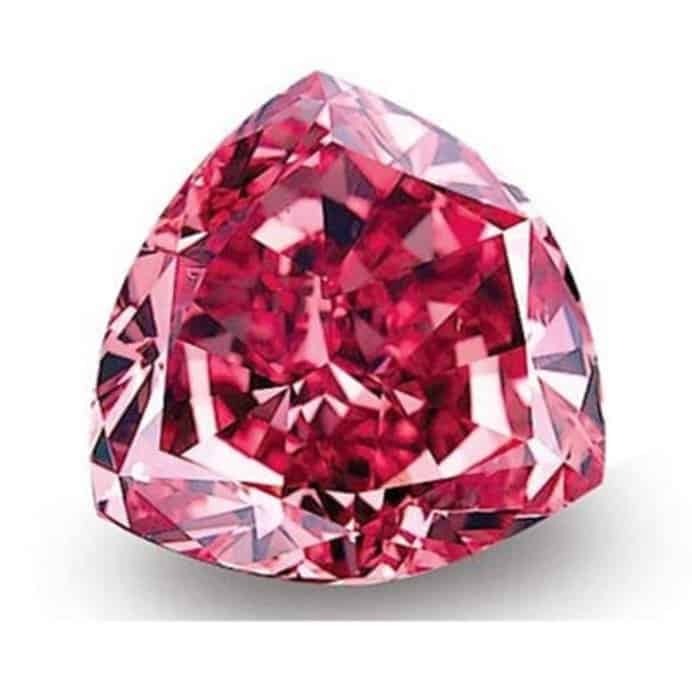 The Fancy Purplish red diamond was sold by Christies, which is famous for its auctions of rare and expensive items, and it sold for $927,000. The stone was later to become known as the Hancock Red. It wasn’t until 1998 that the famous Moussaieff Red was cut and sold. In between these times, the red diamond has fluctuated in attention. There’s an exhibit at the Smithsonian that features “The Spendor of Diamonds” and shows the key attraction; the Moussaieff. It’s been on exhibit since 2003. Even a 0.72 carat round loose diamond can be priced relatively high compared to other colored diamonds. Take a look at the diamond below – beautiful color, but it doesn’t come cheap either. In other diamond color categories, there are Light and Faint while that’s not true with red diamonds. When you get down to light or faint shades of red, you’re moving into pink territory. 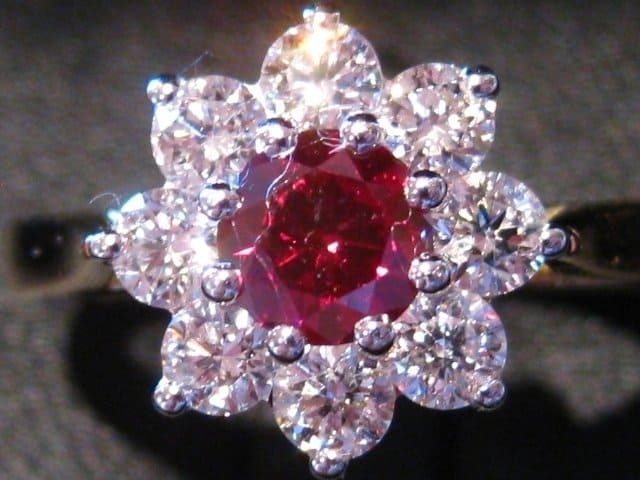 In fact, some jewelers consider some of the lighter colors of red to be saturated pink. In red diamonds, you’ll only see Fancy Red as a grading or intensity level. How Does a Red Diamond Form? Colorless or white diamonds are created from carbon, which is also true of the red diamond. When the red diamond is formed, there’s a deformation in the structure of its atoms called plastic deformation. Without that rare deformity, it would become a white diamond. This is why it’s so rare to see red diamonds. What Mine Produces Red Diamonds? Red diamonds are mostly found in mines located in Africa, Brazil and Australia. The Argyle Mine in Australia produces much of the world’s rare diamonds like the red, pink, purple and blue diamonds. The GIA rates the cut, clarity and color of a diamond to determine the depth of color and the clarity of the stone. The color and clarity can impact the prices of all diamonds whether they are white/colorless diamonds or colored ones. When red diamonds are taken from the mine and brought into the cutting room, they are not modified with brilliance in mind like other diamonds. In fact, white or colorless diamonds are cut into round brilliant shapes more often because it really enhances the brilliance and fire of the diamond. In red diamonds, they are cut to enhance their color. When choosing your diamond, you should be focusing on the quality and depth of the color long before you settle on the cut of the diamond. With the round cut producing a low color saturation that isn’t ideal in a red diamond, which depends on its color for its uniqueness, the round diamond cut isn’t a good choice. Instead, you should focus on shapes that increase the color and really make it deep and as rich as possible. The best cut for the diamond depends on the diamond itself. In some studios, a red diamond can be examined for months before determining the best cut for that particular diamond. Red diamonds are rare and incredibly special diamonds, but they are graded like white diamonds. The color distribution in a red diamond can lessen the value. While it’ll never be as low as a brown diamond in price, the color distribution can have an impact. 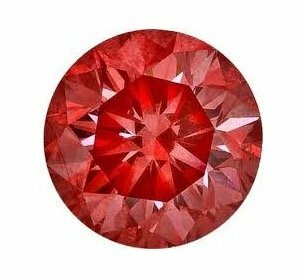 The color of a red diamond should be uniform throughout the stone. There shouldn’t be any splotches of dark or light areas that will mar the uniformity of the shading. When there are shaded or lighter areas, the price can drop compared to other red diamonds of the same size. Red diamonds have an intensity that can often mask large flaws. The color is often the primary factor in assessing the clarity of the diamond. If the flaw or inclusion is smaller, it won’t mar the color of the red diamond. In all the colored diamonds, the red diamond is more dependent on its color staying as even as possible. Imperfections are not going to be as visible if they don’t mar that color. The clarity of the diamond rarely rates higher than VS1 and tend to range around SI2 to VS1 in clarity. When looking for your red diamond jewelry, it’s best that you focus on the distribution and hue of the color itself rather than the clarity of the diamond. Small flaws and inclusions are the norm. While red diamonds are incredibly rare, the addition of brown or orange can be incredibly beautiful while also giving people a chance to own a stunning red diamond. 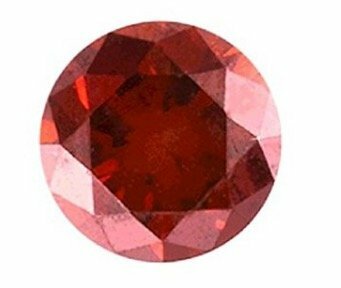 When a red diamond has a tint of another color like purple, it’s listed first. A red diamond with an orange tint would be listed as Orangish Red. A red diamond with hues of pink and orange can bring the price down considerably, especially if they aren’t polished and cut. On the other hand, a purplish red diamond can cause prices to rise on a diamond that is already incredibly costly. When the colors are listed as purplish red or brownish red, that means that the secondary color is more dominant while the one listed with -ish, is a tint. If the stone is called purple red, that means both colors are equal. 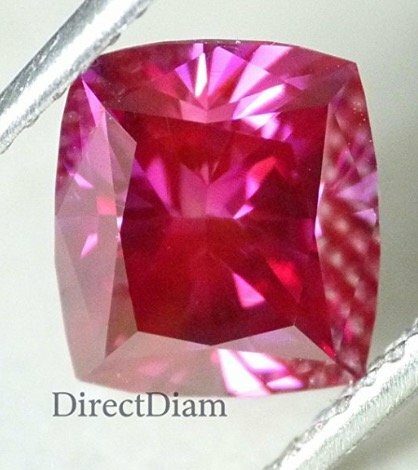 This Leibish Fancy Purplish Red radiant shaped diamond costs more than the previously-mentioned red diamonds based on the tint color of purple. The Hancock Red Diamond is a 0.95 carat red diamond that was named after Warren Hancock. It wasn’t fancy for its size but it’s color, which is a purplish red. The Rob Red is a Fancy, pear-shaped red diamond that is 0.59 carats. It’s one of the purest and most saturated red diamonds in the world. The supreme purple star is a round cut diamond with a real debate about color and clarity. From one angle, it’s a deep purple while from another angle, it’s a purplish red. Red diamonds that are treated to enhance their color could turn a plain brown diamond into a more saturated red diamond with brown tones. While it will never rival a Fancy red diamond in terms of color, it also won’t be as expensive. This brilliant red diamond is half the price of a Fancy red diamond while being larger. It’s been irradiated to enhance its color. Diamonds can be irradiated or have high pressure, high temperature applied to them. It’s also known as HPHT. Simulated red diamonds are ones that are created in a lab environment using some of the same materials found in a real diamond. The only way to tell the difference in a simulated diamond is with a microscope. Many investors will buy red diamonds and hold them to sell a few years later, while collectors will add them to a collection of other beautiful colored diamonds. These types of buyers do not want to purchase irradiated or simulated red diamonds, but they’re a good choice for someone who loves the deep red of the diamond. If you have your heart set on a red diamond, treated diamonds can be a great substitute. They’ll give you that deep red color without the huge price tag.